Don’t you get exhausted sometimes to handle all your business processes and people? sometimes you may wish those tasks to carry out automatically. Well, this article presents you enterprise applications that help you purge with this exhaustion. You must be wondering what these applications, basically are. Before going into that rhetoric definition of the word “Enterprise Applications”, I prefer giving you real-life business processes that may be automated. So how about billing of your customers? instead of manually billing your every customer why not send the bill over the internet and the customer will pay it electronically. Moreover, why not have a single management software for managing all your operations related processes? Also, having an integrated software to manage your core business processes will undoubtedly be of great help. isn’t it? You would definitely like to connect closely with your existing and potential customers, convert them to long-term customers and create value for them. Yes! You have CRM (Customer Relationship Management) software for that. An enterprise application is a computer software for organizations, designed to assist organizations in their processes. Similarly, it helps in integrating all the different processes currently functional in an organization to ensure smooth and seamless operations. 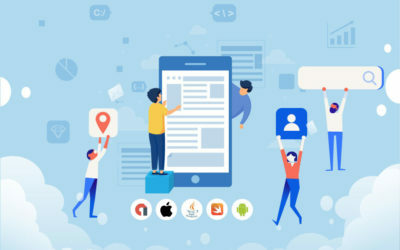 These apps incorporate business-oriented tools including online payment methods, billing systems, business process management, enterprise resource planning (ERP), customer relationship management (CRM), collaborations, forms automation, HRM tools and much more. Having an Enterprise Application allows for more automation benefits within an organization. Having automated workflow will help in increasing the speed and efficiency of processes and employees will also find ease in solving the problems. Enterprise applications enable and encourage flexibility in handling the business problems. It allows for quick responses to the ambiguities that may arise related to corporate structures or employees. It provides an easy to use interface, that allows even non-tech savvy to operate and handle business situations easily. The flexibility and automation lead to increased overall business efficiency. It encourages more employee engagement in business problems. Also, the automated processes and IT infrastructure helps in seamless operations. As the user base grows, it provides for more scalability for an organization. Enterprise Application allows for more data shared among an organization. So, with an ease of use of this single unified base for all problems, almost everyone will be aware of the problem and there will be a collective effort to solve the problem. This software would allow a manager to keep a constant eye over new business opportunities related to supply chain or any changes in the market and find ways to tap into them. Thus, it focuses on proactive and futuristic approach. 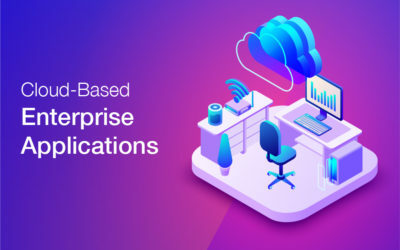 Now as we are much aware of the concept of enterprise applications, Let’s ponder upon the importance of having these applications in the cloud. Do you understand, when someone says the CLOUD? Let us help you out if you don’t. Cloud computing is the process of using remote servers based on the internet to store, process and manage data through configurable shared resources. It serves the user from basics of storage, processing, and management to advanced data handling, including natural language processing, AI, along with standard office applications. Cloud considers the dynamic requirements and allows for unexpected hikes in demand. You can pool in different computing resources to serve many customers, with different physical and virtual resources assigned according to consumer demand. You can access the cloud applications through different client’s platforms .e.g. Mobile phones, desktops, APIs etc. Cloud applications allow for more measurability in terms of resource usage while designing modular systems and subsystems. They are assigned with pre-determined resources that can be provisioned based on the demand of the service. Owing to these amazing characteristics of cloud computing, don’t you wish to shift towards it? If you are having a problem with making a decision, Let us help you with this as well. It solves the complexity problems. Embodies flexibility in a sense to increase capacity as needed, when needed. Easier for applications to configure and alter. As it uses remote resources, organizations save cost on equipment and servers. Let’s now look into the process of developing such apps. Enterprise application development should entirely be based on cloud and you should not take any half measures. Next, it is to select a robust community architecture to encourage collaboration within teams and organization to develop quality cloud-based apps. Once the architecture is selected, it is important to codify the development processes to make sure that the product is designed to align exactly with the client’s needs and also to increase developer’s productivity. 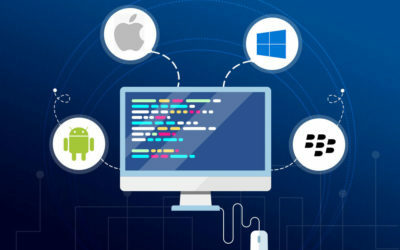 Next, you need to automate the development and operations of the app in accordance with on-premise build, test, staging and deployment environments. Improve the last step by allowing hybrid environments. Use the mixture of public and private resources to ensure more flexibility and more data deployment options. 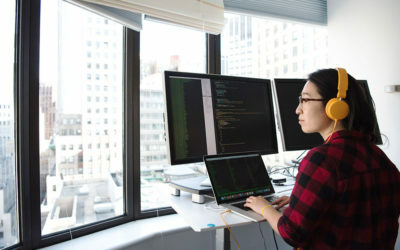 While you follow the process above to develop cloud-based enterprise applications, you also need to consider some principles. Keeping Session State External: It is important to avoid keeping it in your app as it limits its scalability. Store Temporary Information In Remote Location: you should store all the temporary information in a remote location such as SQL or NoSQL database instead of local systems. Avoid Using Local File System For Logs: if the logs are saved in a local file system, there is a possibility of losing all valuable data in case of any crash. So log aggregators are directed remotely or else, open source aggregators are used. Scalability: applications should be scaled horizontally and not vertically. Avoid Using Uncertain Protocols: in case of adding or removing nodes under load, developers must use protocols that corresponds to the stronger apps by incorporating special features for configuration. Avoid Infrastructural API: As it is problematic when monitoring the app. Existing monitoring tools are equipped with understanding the managed thread pools but are unable to identify bottlenecks. App Installation Dependencies Needs To Be Minimized: the app installation process should be scripted and reliable to configuration data externalized from scripts because cloud environments are flexible to disruptive changes. Minimize Cycle Gaps: it is important to minimize the differences between development, staging and production cycles. Using a cloud platform helps in saving on hardware and maintenance costs for businesses without compromising on quality. As these applications are easily accessible from any place or any time, they tend to increase the productivity of employees. Cloud-based solutions tend to streamline your interactions with customers, thus enhancing their experience. Cloud solutions help in providing more secure backup and data recovery systems for its users in case of any disaster. Data retrieval is made possible through cloud computing. Whatever device you are using, if it’s connected to the cloud, you don’t have to worry about your data in case that device has somehow vanished away. So, with everything being automated and connected to the internet, the business processes tend to be more streamlined than before. Thus, it seems like a nightmare sometimes to do each and every task of the business manually. In this fast-paced era of technology, Companies are looking forward to the ways in which they can reduce their workload and make them quick. Also, automating various processes make businesses focus, essentially, on their core competencies and achieve broader business objectives. So, do you wish to design your cloud-based enterprise applications? ZIN lets you enjoy the wonders of these apps and streamline your business processes. I would appreciate your feedback over this article in the comments section below.